Hey there! Thanks for joining me for yet another day of the Papertrey Ink February anniversary countdown. 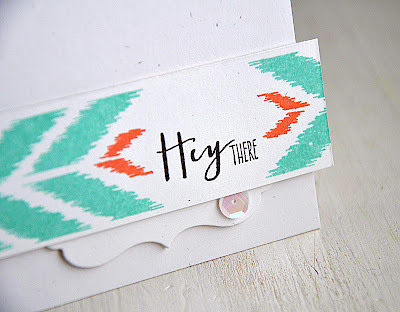 I'm back today to share with you more of my new set... Irresistibly Ikat. From the looks of it, it sounds as if some of you are as excited about this set as I am! Let me give you a little info... The trendy patterns found within the pages of all fashion & home decor magazines can now be applied to paper with this new set of designs. Irresistibly Ikat includes 10 design images and 4 sentiments. Mix & match these different shapes to build and create stunning patterns of your own design. At a cost of only $15, this set will be available for purchase beginning February 15th at Papertrey Ink. 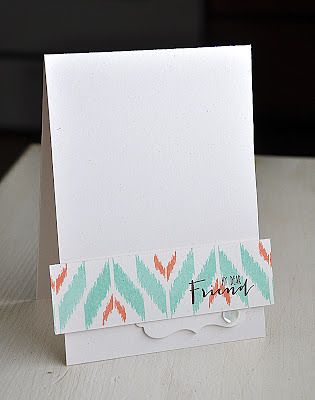 I thought it fitting to use a card trio as a perfect way to share with you a few different way to utilize some of the images in the Irresistibly Ikat stamp set. All in a lovely color combo of aqua mist, melon berry and smokey shadow. Chevron style images are included in a large and small format. They look great stamped alone or nested one into the other, like so. 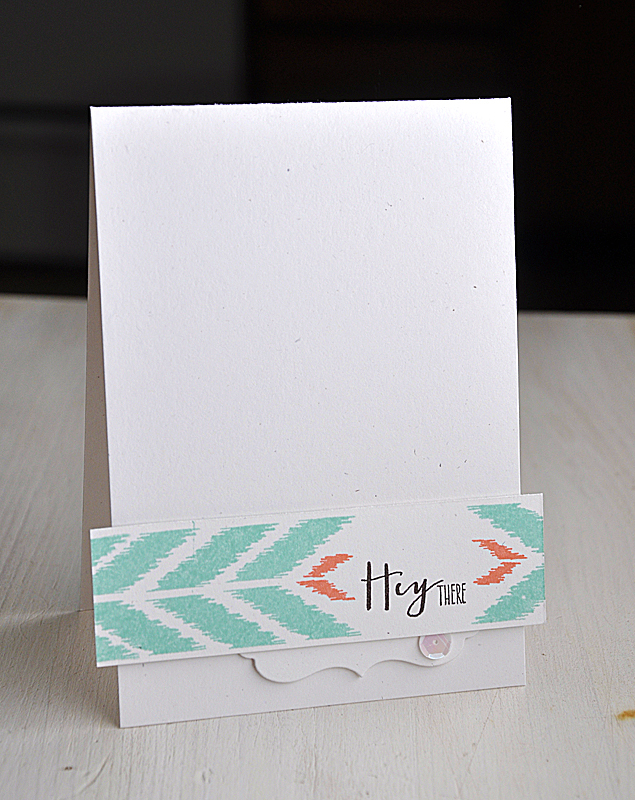 The same images from the card above were used here, just turned onto its side and stamped along a rustic white 1 1/4" wide cardstock strip. The two smaller chevrons were inked in melon berry to help highlight the greeting. 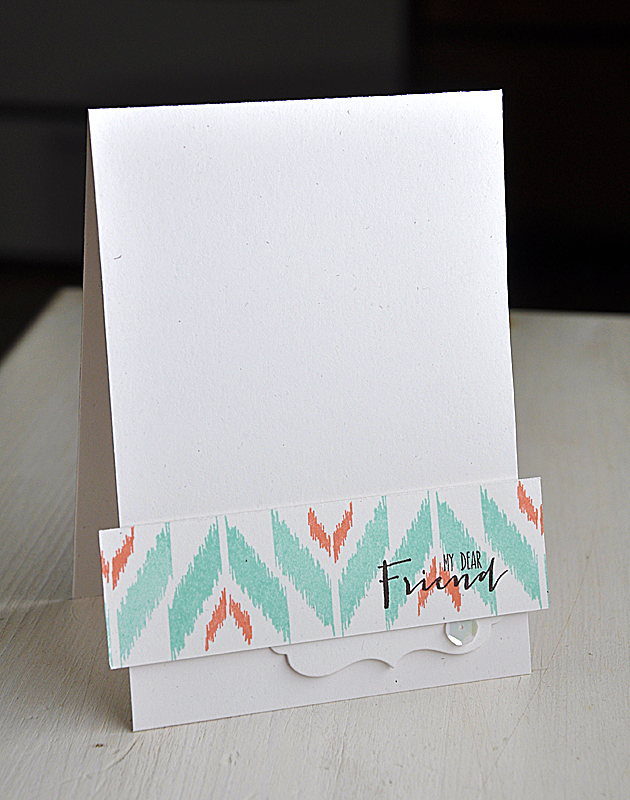 Each card has been simply embellished with a die cut edge (more info on that particular die here) and a sequin, both tucked carefully under the stamped strip. Last but not least, the ikat dot. Love these! This are quickly becoming my new polka dot essential. 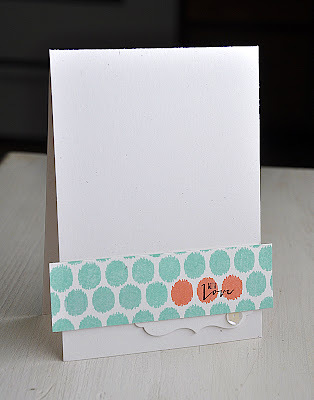 The ikat polka dot strip stamp is made up of four of these fun dots. 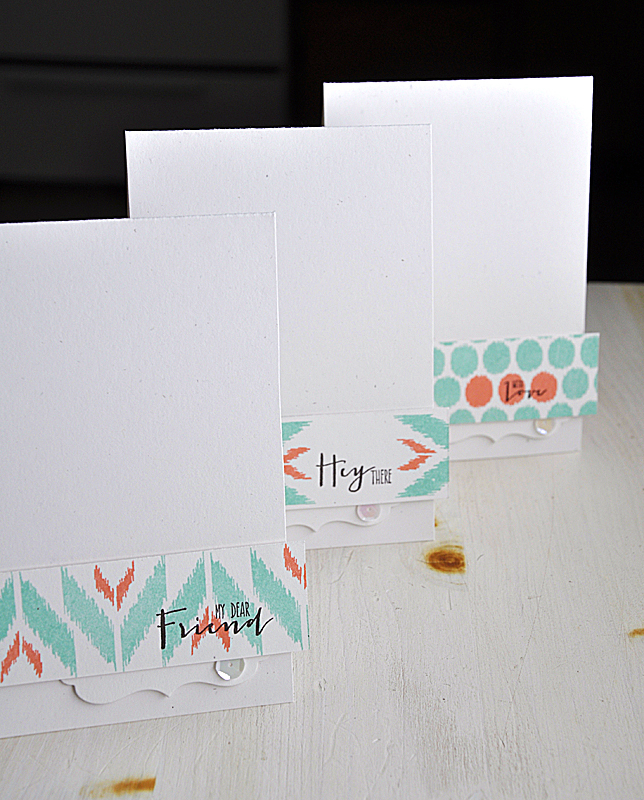 I carefully inked up just three, in melon berry, and stamped. 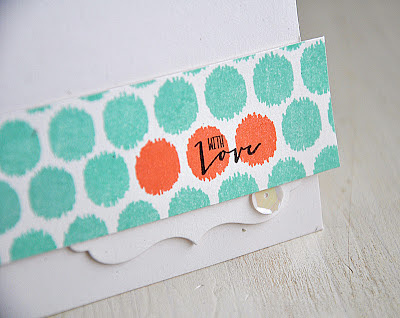 Then finished the strip off with rows of aqua mist ikat dots and a lovely sentiment. Well, that concludes today's look at Irresistibly Ikat. Just remember... this stamp sets will be available for purchase through Papertrey Ink, beginning February 15th. In the mean time, I'd love to know what you think, so please feel free to share! Now, be sure to visit Nichole Heady, Heather Nichols and Cristina Kowalczyk for peeks. Ashley Cannon Newell has even more of Irresistibly Ikat to share. Also, Heather Nichols, Dawn McVey, Melissa Bickford & Lizzie Jones have peeks to share with you of their newest sets for the month. LOVE, LOVE, LOVE! Can't wait to get this set! Oh my, I too Love, love, love these sets, so trendy too! Can't wait to buy and get! Love your designs. This is such an exciting set. Your cards are clean and simple and thats what I love about them. Love seeing the possibilities for each new set. Yours is so refreshing. Gotta get me some sequins! Your cards are absolutely beautiful ! I'm seriously nuts about this IKAT set...so versatile, the options seem endless. Great job on the design and the cards. Maille, I can't remember the last time I was this excited about a new stamp set. You have knocked it out of the park! I love the unlimited color combinations, and the clean and simple designs (my favorite style) that can be created with this set. Hurry, February 15th! Maille-This is beautiful. So much variety. Love it! Wowzer--I so love your style & these are wonderful! Utterly clever and unique. Sure these will find their way into my shopping cart come the 15th. It's so irresistible that I'll wait until 03.00 am in Spain to be one of the first in the queue to purchase this gorgeous set. I love folk & ethnic stuff in general and I'm simply crazy about Ikat. 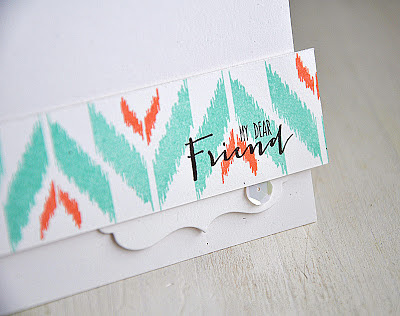 Maile, I started following just a few days ago but I've noticed you're a very creative designer and surely have many projects at hand at the moment but, please, do create more Ikat elements. We'll buy them!!! In the meantime, I'll work on creating my own compositions with the elements you've designed and will leave a link to the PTI gallery. Thank you so much, you made my day, my week, and the next weeks to come! These are gorgeous! Love that they all go together like a set! 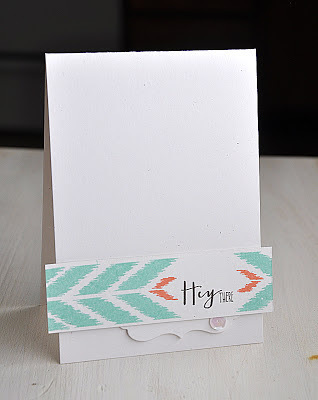 And I love how the stripes of cardstock overlap off the card base! So creative and pretty!